Some things you don’t forget. The birthday of a loved one, your first broken bone. That moment in childhood when you viciously grew up. The words to ‘American Pie’. Neat bourbon. Then there are surprises. Today. Monday 4th July. Independence Day. 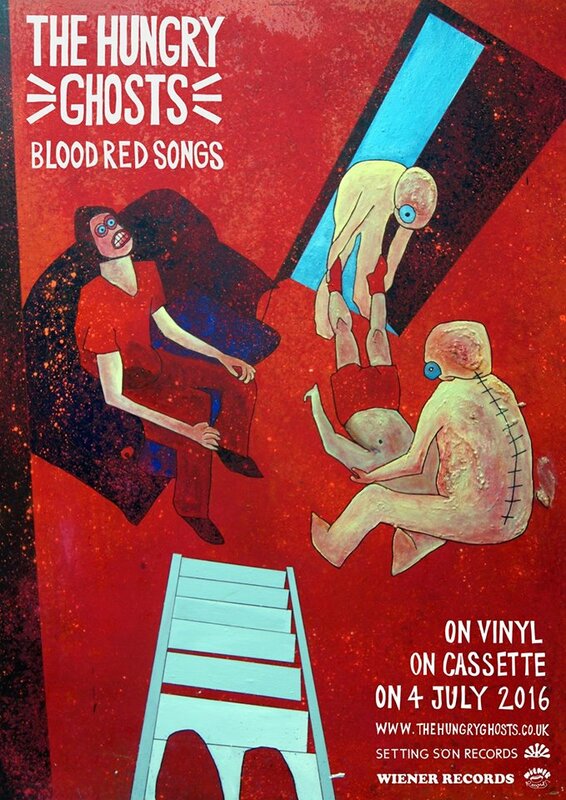 The Hungry Ghosts have released their debut EP, Blood Red Songs – available through Setting Son Records. Four tracks of twisted blues and ‘swamp music’ from the Redditch based four piece. This is not a memory or a surprise. This is a fact. And this is a review – a series of words that explain to you, the reader/listener, my opinion. I’ll save us all some time. Ferocious. Superb. Dark. Ball grabbing. One track too short. 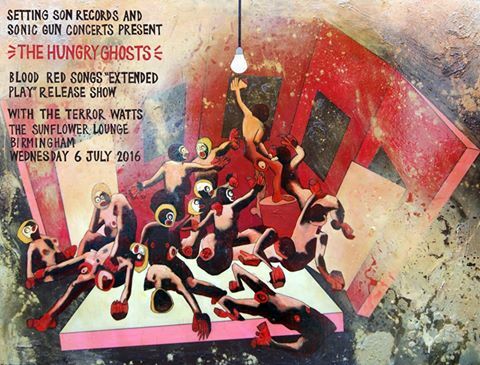 The first time I saw The Hungry Ghosts was both a memory and a surprise, having been invited to see them play one of their ubiquitous support slots – this time at The Sunflower Lounge. I arrived alone, squeezed myself onto the stairs and watched, loaded with dark rum and tired anticipation. But it didn’t take long. After about a minute you knew, I knew, the room knew; we were watching something significant. There are bands and there are rock bands. The Hungry Ghosts were, from the first moment I saw them, unabashed and raw. A little messy, a little honest, and unlike any other contemporary I could cite on the circuit. Such a surprising memory, in fact, that I’ve been a little obsessed ever since. Since then Birmingham Review has followed The Hungry Ghosts, on the record on off – interviewing, publishing, interviewing, not publishing – and waiting for the day we could cover them as a headline act. That day is Wednesday. And that gig is back at The Sunflower Lounge. Click here for details. But the groundwork that has been put in place, both the on stage and studio foundations, shines through in Blood Red Songs; fours tracks of undiluted, gritty, psychedelic blues rock – screamed out like the end of your breath. From the opening dark twisted metal riff of ‘Father Snake Moan’ you know where you are – lying on the back seats of a reckless Firebird, a bottle to your lips, Joe Joseph’s contorted vocals making you run to or from something that may well destroy you. Then the jagged strut of ‘Super King King’ comes through and you’re back up, the wind pushing your face around. This is the easiest song to hold; three minutes of stripped back mescaline blues, Jodie Lawrence blending into a vocal lead – before a rising deep breath welcomes a maelstrom finale I haven’t heard since The Smashing Pumpkins’ ‘Starla’. Produced to perfection with bravery on every corner. ‘Death Rattle Blues’ follows with a Velvet Underground punch; backwashed steel drum echoes, raw vocals, droning guitar drawls – stalking the room like John Travolta with a shotgun. Before the comedown of ‘Silver Horses’, an opiate lullaby, closes this rude awakening a little too early. Overall Blood Red Songs is ferocious; a superb debut EP, one that introduces the dark severity of this band in a playful ball grabbing grip. My only complaint, that it’s arguably one track too short. But The Hungry Ghosts have risen to something else with this recording – it’s brave, accomplished, and it wants to live in your head. A calling card; one I can see confidently weaving itself through the empty cider bottles and fetal positions of a festival afternoon. They’ve worked hard too, fine tuning an anarchy that’s much more graft than surprise. And if Blood Red Songs doesn’t create a further calendar of memories, then there is something simply flawed with the world.